Time is precious. Life is so busy that it’s often hard to take time away for ourselves. However, it’s essential that we take a little time to look after both our physical and mental wellbeing. If you know treatment is vital, but you’re short on time, then an Express De-stress treatment may be for you. 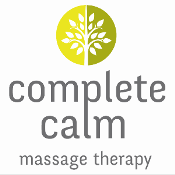 Express De-stress massage is done from an ergonomically-designed chair. This means it can be set up easily in any quiet space, including an office meeting room. As you remain fully-dressed for this massage, there’s no need for privacy. Therefore, an Express De-stress massage can easily be done on your lunchbreak, allowing you to take a snapshot of time away from your hectic day. 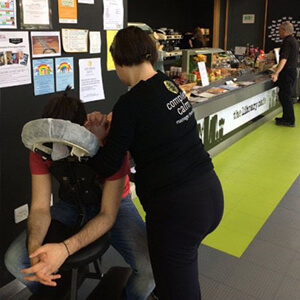 On-site massage can be used as part of a stress management or wellness programme in the office. 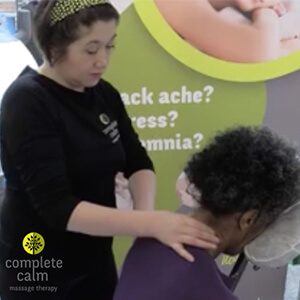 If you’re looking to dedicate some time to your employees’ wellbeing, a short massage can reduce tension, chronic pain, and manage their physical and mental wellbeing. 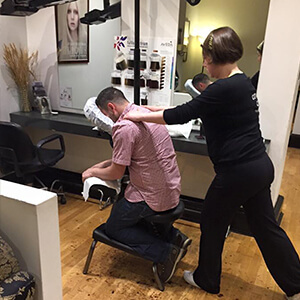 Sessions usually last between 10 and 20 minutes, and the treatment focuses on the back and neck.